on Megamillions or Powerball games. Can you beat the MegaMillions or Powerball Lotto? CLICK HERE! For example, to play the Megamillions lotto game, you need to pick 5 numbers from 1 to 56, plus a bonus ball. QUESTION: what if you could pick your Megamillions Lotto ticket from just 22 numbers instead of 59? You think there might be a better chance of hitting a winning pick? 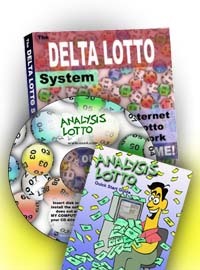 Below is a specific analysis of the different multi-state lottery games, the maximum Delta numbers to use for calculations, and websites where past lottery data can be found for use with the Analysis Lottery software. A FREE version of our Delta Lottery Calculator you can try with the Powerball, Megamillions, and other multi-state lottery games can be found here. High Delta: 22 (Most Deltas will be lower than this number) What's a Delta? Click HERE. Click on "Powerball Numbers" then "Old Numbers". Choose date range. Select all the numbers on your browser's screen and copy. The other games here work the same way. Click your game, then on "MM Numbers" then "Old Numbers". Choose date range. Select all the numbers on your browser's screen and copy. The other games here work the same way. High Delta: 19 (Most Deltas will be lower than this number, yes, correct, deltas don't help as much with this game) What's a Delta? Click HERE. Click your game, then on "Two by Two Numbers" then "Old Numbers". Choose date range. Select all the numbers on your browser's screen and copy. The other games here work the same way. Click your game, then on "Hot Lotto Numbers" then "Old Numbers". Choose date range. Select all the numbers on your browser's screen and copy. The other games here work the same way. Click "Winning Numbers". Where it says "Advanced Search" enter your game and dates, click "Submit". Select all the numbers on your browser's screen and copy.